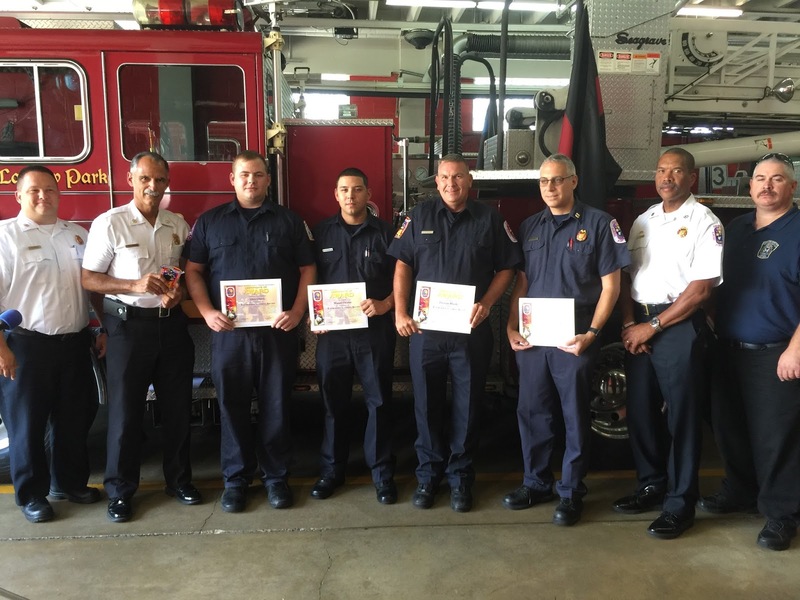 On Wednesday, August 4, several firefighters, both volunteer and career, were presented with Emergency Services Awards for their actions on two incidents. 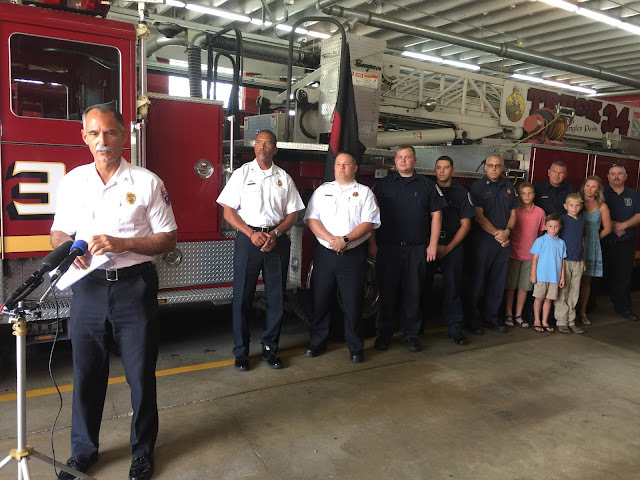 The first incident was for heroic actions during an apartment building fire where two residents were rescued from their top floor balcony. The second presentation was for actions taken by a single member while off duty. 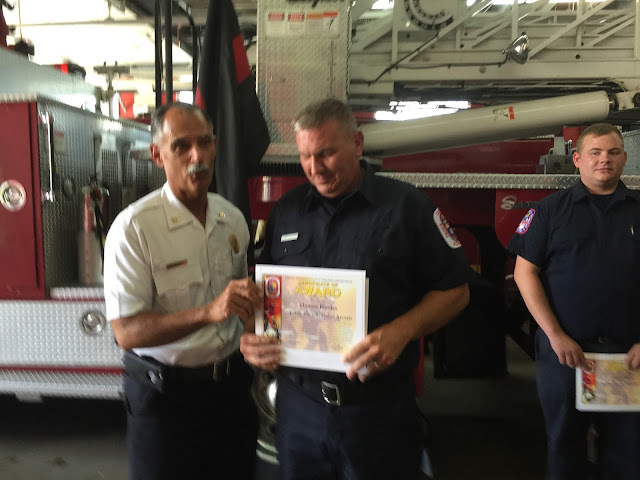 Chief Deputy Ben Barksdale, Deputy Fire Chief Dennis Wood and Chillum-Adelphi Volunteer Chief Chuck Aldridge were in attendance while Fire Chief Marc Bashoor presented the awards at the Chillum-Adelphi Fire/EMS Station 834. The first Emergency Services Awards were presented to Fire Fighter/Medic Lieutenant Israel Tabak, Fire Fighter Miguel Ocasio, Fire Fighter Thomas Rhodes, and Volunteer Fire Fighter Allen Owen. On the evening of January 13, 2016, units from Fire/EMS Station 834 were dispatched to 9205 New Hampshire Avenue. You arrived on the scene to find fire showing from a fully-involved apartment on the top floor of a 4-story in front and 6-story in the rear mid-rise apartment building with a wood roof. 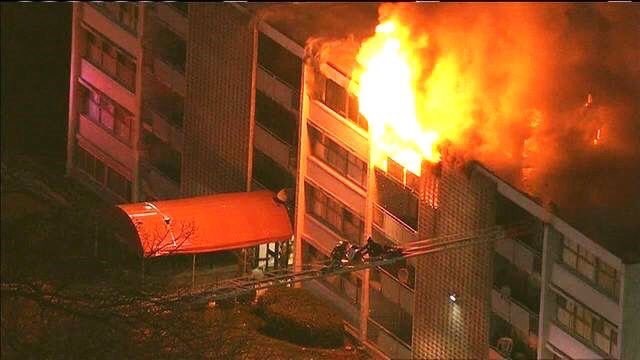 There were obvious rescues on arrival, with two residents trapped on the balcony adjacent to the fire apartment and flames extending into their dwelling. Your performance on the scene of this incident that saved two lives is both commendable and worthy of recognition. Therefore, you are hereby awarded a Fire/EMS Department Emergency Services Award. Your actions reflect well on you personally and professionally and exemplify the excellent caliber of service we strive to provide to the residents of Prince George’s County. 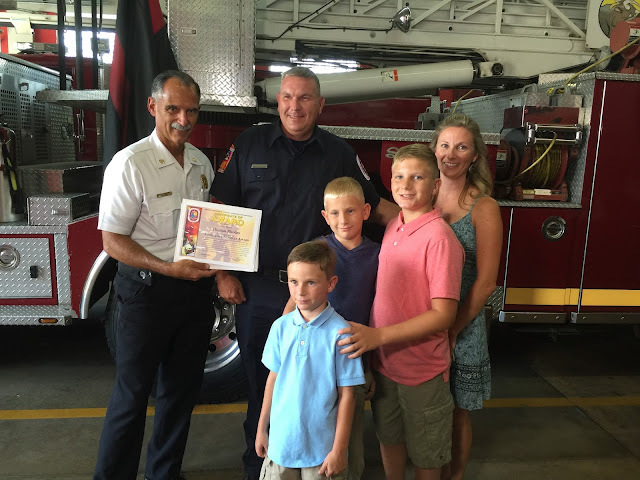 The second Emergency Service Award was presented to Fire Fighter Thomas Rhodes whose wife and three sons were in attendance. On the morning of Thursday, June 30, 2016, you and your family came across an accident that had just occurred while traveling on I-81 North in Virginia. You observed an overturned tractor trailer in the median, with smoke coming from its engine. You immediately pulled over, exited your vehicle, and ran toward the incident. Upon reaching the truck, you encountered two people attempting to break the front windshield and rescue the trapped driver. At your suggestion, the three of you broke out the rear window and removed the victim from the truck. Less than one minute later, the truck burst into flames. You then proceeded to the other side of the tractor trailer and discovered three additional cars and an SUV were also involved in the accident. You quickly climbed into the SUV to assist the young female driver who was trapped. Once inside, you realized the victim was hanging upside down with her seatbelt on; her hair was trapped beneath the vehicle; and she was experiencing difficulty breathing. Lying on your back, you were able to push up on her shoulders and relieve some of the pressure so she could breathe better. You remained in the SUV and helped hold her up for approximately 45 minutes to an hour while she was being extricated. Fortunately, all injured persons were transported to local hospitals and there were no fatalities. Your quick thinking and immediate action on the scene of this incident helped save two lives and is both commendable and worthy of recognition. Therefore, you are hereby awarded a Fire/EMS Department Emergency Services Award. Despite being on vacation and traveling with your wife and sons, you selflessly placed yourself in harm’s way on behalf of others who were in danger. Your actions reflect well on you personally and professionally and exemplify the excellent caliber of service we strive to provide at all times and in every circumstance.